A weekly newspaper has made the switch to tabloid format after 119 years as a broadsheet. The Aldershot News and Mail unveiled its new compact look yesterday and the new 72-page edition includes eight pages of sport and fresh interactive content for readers. The cover price of 70p also includes an additional 44-page property section, What’s On guide and new competitions. Published since 1894, the Trinity Mirror title has changed its appearance following requests from readers for a more conveniently sized newspaper format. Marnie Wilson, editorial director at Trinity Mirror Southern, said: “The News and Mail Series is a long-established and much-loved local newspaper. 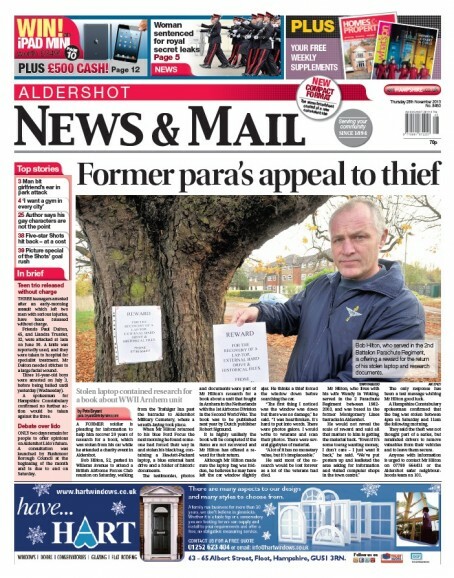 It has six editions covering Aldershot, Farnborough, Fleet, Camberley, Yateley and Ash and Farnham. “Three of these towns, Aldershot, Farnborough and Camberley, are going through a regeneration – so we thought we would regenerate the newspaper as well. “For some time now, people had been asking for the paper in a more convenient size and the time seems right to do that. “The audience for Get Hampshire, our website for the News and Mail, is growing fast. More people are looking at our content than ever before. An article on the newspaper’s website describes the switch as a landmark moment in the long history of the News & Mail. “While the size of the page may change, the ethos and priorities of the paper will not,” says the article. “Over the past century we have covered world-altering international events, summer fetes, murder trials, charity bake sales and everything in between. Another Trinity Mirror title to ditch its broadsheet size includes the Wokingham Times which switched to compact format in 2012. Much loved is it Ms Wilson? Is that why its sales figures are going through the floor? Probably a reaction to its reporters being made to work in an office in a different county (Guildford in Surrey). Like many of Trinity Mirror’s papers in that part of England if you take out the hits sports stories get on its websites then the picture appears a lot worse. Within in the next 12 months the News and Mail will stop being a paid for paper.